Below are two step-by-step guides on how to perform the bodyweight plank and weighted plank. Note, that both can be done from the forearms and the top of the push-up (tall) position. Below is a step-by-step guide on how to properly set up and execute the bodyweight plank (forearm and tall position). This can also be done from the tall position. Assume the top of the plank position, with the forearms on the ground, feet together, and core tight. Be sure to not shift weight back or forwards when you do this. The limbs should be able to move freely from the core, meaning the pelvic and lumbar positioning should not be altered when getting set into the plank position. Coaching Tip: You can also do the plank from the tall position (hands extended, see next image). To do this, simply extend the elbows and assume a stable push-up position. Once you are in the plank position, focus on maintaining a flat spine and tight core. If you would like, you can extend the arms into the tall plank position. As you hold the plank position, focus on keeping the upper back flat (by actively pressing through the forearms/hands into the floor) and then pressing the legs together. Coaching Tip: Don’t let your hips drop. It can be helpful to have someone help you find the proper positioning and keep you diligent in maintaining it. Below is a step-by-step guide on how to properly set up and execute the weighted plank (forearm). This can also be done from the tall position as well. 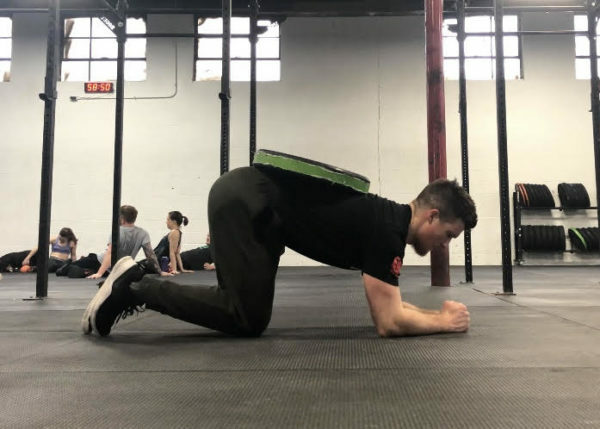 Start by assuming a quadruped position with a plate placed on the middle back. You can do this yourself or by having a partner assist you. Be sure to set the knees under the hips and the hands under the shoulders, creating a strong and stable position. Coaching Tip: Pull the belly-button into the spine, making sure to place the lumbar spine into a neutral position (think about pressing the lumbar spine into the weight plate). Step your left foot back, maintaining a braced core and neutral lumbar spine. Then, repeat with the other leg. Be sure to not shift weight back or forwards when you do this. The limbs should be able to move freely from the core, meaning the pelvic and lumbar positioning should not be altered when getting set into the plank position). Once you are in the plank position, focus on maintaining a flat spine and tight core. As you hold the plank position, focus on keeping the upper back flat (by actively pressing through the forearms into the floor) and keeping the legs pressed together. Below are three benefits of planks (both weighted and unweighted variations). For some lifters, the core may actually be a limiting factor during loaded movements like heavy squats and deadlifts. 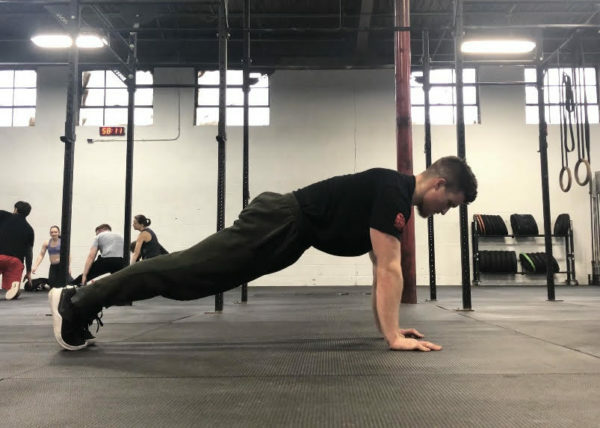 Adding planks into a training program that already includes loaded movements can help a lifter understand what it feels like to contract the core maximally and/or enhance a lifter’s ability to contract the core for longer periods of time. While bracing under load is highly specific to breathing patterns, adding in the plank and other core strengthening exercises can help a lifter utilize more muscle mass and increase contraction strength of the abdominals, obliques, and erectors under load and during movements. The plank trains the muscles groups and positioning used in most strength, power, and fitness movements (neutral spine). While the plank itself is a stationary movement (it can be progressed into a dynamic movement), the plank can be done to reinforce proper pelvic and spinal stabilization and increased muscle activation and strength of the obliques, abdominals, and deeper core muscles. The plank is a core movement that has a wide application to strength, power, and fitness sports, exercises, and training. The below muscles are worked, primarily in an isometric manner to support strong core growth and reinforce proper core tension and bracing capacities both with and without load. The rectus abdominis are automatically contracted in this exercise to resist spinal extension. While this deeper muscles of the core (see below) are highly active, this exercise can be a sufficient way to add variety to your rectus abdominis training. The transverse abdominals are a deeper core muscle (underneath the rectus abdominis, which are more superficial muscles), and are directly responsible for stabilizing the core for nearly every moment. These same muscles get taxed during squatting, deadlifting, and most loaded movements, making the plank a great way to attack them in a more specific manner. The glute muscles (gluteals) are responsible for aiding in pelvic stabilization and supporting the abdominals and erectors to maintain a neutral lumbar spine. Squeezing the glutes can also help to contract the core hard, which is often used in the plank and other strength lifts as a performance enhancing cue. The scapular stabilizers, specially the rhomboids, are responsible for stabilizing the upper back and thoracic spine in the plank (both in the forearm and top of push-up position plank variations). Without proper stabilization of the thoracic spine, the lumbar spine and pelvis will often be placed in extension to account for poor isometric control of the upper back. This is a key fault to look at when determining why a lifter may have issues stabilizing the lumbar spine correctly (often due to either poor core stability and/or lack of thoracic mobility, or both). Below are some reasons why strength, power, and fitness athletes can benefit from performing the plank. Planks are a beneficial exercise for increasing core strength, bracing capacities, and reinforcing proper core stabilization and positioning needed for loaded movements like carries, squats, deadlifts, and overhead movements. Additionally, they can help to increase strength and muscle hypertrophy of the abdominals/obliques/and deeper core muscles; all of which are active in strength and power competition lifts and most functional fitness exercises. 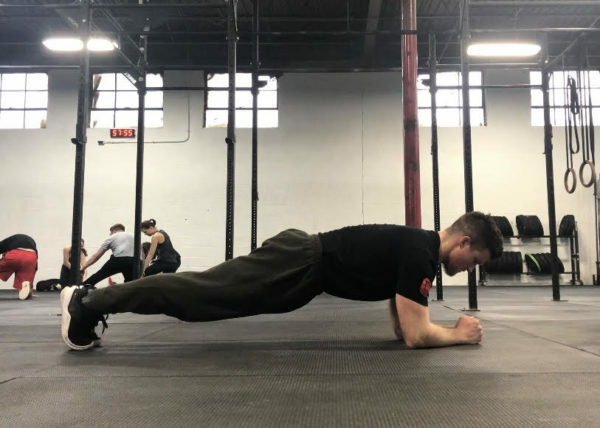 The plank is a foundational core strengthening exercise that challenges isometric control and strength of the abdominals, obliques, and spinal stabilizers. This stationary exercise can then be progressed to more challenging variation to increase dynamic core strength and functional fitness (see below). Below are three primary training goals and programming recommendations when utilizing the plank into specific programs. Note, that these are general guidelines, and by no means should be used as the only way to program planks. Furthermore, adding weight to the plank can also be done to increase difficulty and reinforce training goal adaptations. Typically, planks are trained either after main strength movements (as to not pre-fatigue the core strength needed for movements like squats, deadlifts, etc) OR are found in activation/warm-up segments to increase muscle activation. For general core strength and development, athletes can use a combination of load vs non-loaded planks, shorter and longer duration holds, etc. Try starting with the below recommendations, then build up in either weighted or longer time duration sets. You can add weight to the plank by stacking bumper plates on the middle back. Adding loading can be a great way to increase core strength. Planks can be done to increase muscle hypertrophy via increase time under tension. Note, that there is not an eccentric or concentric component to the movement, so overall hypertrophy may be limited. Increasing time under tension is a good way to induce muscle growth. Try pairing weighted planks with other core strengthening exercise like landmine rotations for increase core development. Increased core endurance and stamina can be developed with longer duration sets and increased time under tension. Add planks to total body circuits as active rest periods for more advanced training program. Below are three (3) plank variations that can be used by coaches and athletes to keep training varied and progressive. Want more, take a look at these 10 simple plank variations for a stronger core! 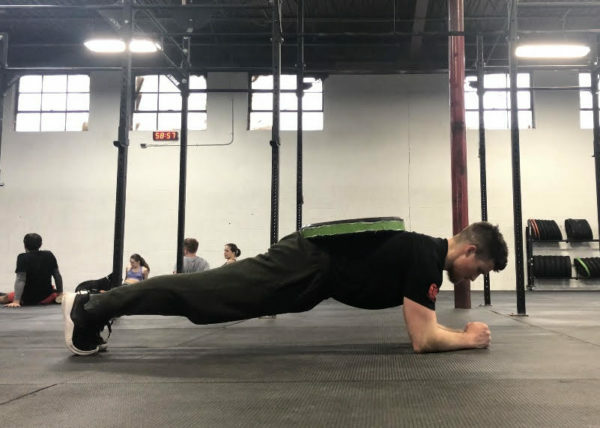 The side plank is done nearly the same to the regular forearm plank, with the exception being that the lifter is performing the movement on their side (with their feet and elbow/forearms on the ground). This exercise challenges the isometric strength of the transverse abdominals, obliques, and scapular stabilizers. The bodysaw plank is a plank done with the feet on sliders, a foam roller, or other moveable surface. When in the plank (either forearm or top of push-up plank), the athlete slides their legs backwards maintaining a neutral spine and a contracted core (the farther they slide back the greater they body will want to go into spinal extension). This exercise also reinforces proper scapular stability and strength, and is a good scapular warm-up as well for movements like squats, presses, and overhead movements. The 3-point plank is simply a plank done with one limb lifted off the ground, such as one arm or one leg. In doing this, you force the lifter to restabilize their body in an unbalanced position without allowing the pelvis to drop laterally or allow the spine (lumbar or thoracic) go into excessive flexion/extension. 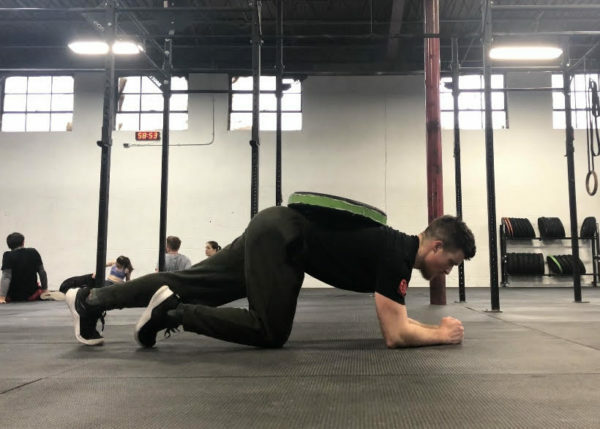 This is also a good variation to progress to movements such as bird dog planks and/or increase loading on the abdominals (due to more weight being supported). Below are three (3) plank alternatives coaches and athletes can use to increase abdominal strength and muscle hypertrophy/endurance. L-sit holds are a challenging core exercise that require great amounts of isometric core and hip flexor strength. This gymnastic-based movement is highly challenging to the obliques as well. Be sure to check out our L-Sit Exercise Guide and learn how to master this advanced bodyweight core exercise. This plank alternative (which could also be a variation) can be done both from a supine and prone position, and entails the lifter to place both their feet and upper back/chest onto a bench, suspended over the ground like a bridge. This is extremely challenging and forces a stronger hollow hold position and/or reinforces proper back extension. The bird dog plank/hold is a great exercise for reinforcing core stability while including hip and shoulder movement. In doing so, you can reinforce proper bracing and spinal stability during movements that require leg and arm movements. Additionally, the bird dog plank requires greater stabilization and anti-rotational stability due the imbalanced positing of the plank.